Lyle: If you're new to playing that scale, or new to "jamming" just fiddle around with the notes from the scale while the looping jam track is playing in the background. 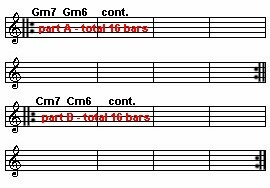 Lyle: Since the two chords are Gm7 and Gm6, this tells you that you are in the key of F major because of the Gm6 chord. Minor 6 chords are the second chord of a key. So Gm6 is the second chord in the key of F.
Lyle: Try playing that arpeggio while the jam track is playing. Notice how "funky" it sounds. Lyle: Notice in riff 2 the sliding technique. Lyle: You can play in Gm but the two chords in the jam are related to the key of F major. Lyle: Who can tell me what major scale these two chords are related to? Lyle: Correct! Just like earlier, these two chords are the ii chords of a major scale. In this case Cm7 and Cm6 are the ii chords in the key of Bb major. Lyle: So what would be the relative minor? Lyle: The C Dorian minor scale is an option too since the Dorian is the second mode in the key of Bb. Adam: what does the "P" mean? jax: Question, back on riff 3 - F maj scale riff, are you using "skip a string picking" or hybrid picking? Lyle: String skipping. Watch the video and you'll see me picking riff 3. Lyle: I'm going to take a break for now but you can stick around and jam. All the jam tracks from this series are available in MP3 format and for download off my web site - TheGuitar.net . That way you can burn them to a CD and take the jam tracks to your home stereo and crack it up!